As you might imagine, writing for a blog about movies, I tend to see a lot of movies. After years of being a cinephile, you eventually get to the point where you’ve seen most of the movies on the numerous ‘Best of’s…’ lists; maybe you’ve tackled most of AFI’s Top 100, or you try to work your way through IMDb’s ever-rotating top 250 list. If you’re like me, you’ve gone beyond that point. I scour lists from people I barely know on IMDb and Letterboxd alike. I look for interviews with directors I admire to see what they’re watching. If I find a critic I respect (like Ebert), I’ll look at their history of reviews to see what they really like- and that was how I found this film. Ebert named this one of the ‘Great Films,’ and while I won’t so far as to say it’s great, it is certainly worth checking out. A star studded cast, a twisted mysterious narrative, and some bold directorial choices from Sean Penn make this film a roller coaster of a thriller with an ending that really lingers. This is a film about a dark topic, but for those who can stomach it, its well worth the trip. On the night he is to retire, Detective Jerry Black (Nicholson, Chinatown) accompanies his fellow officers to the scene of a viciously murdered little girl. When informing the little girls parents, the mother (Patricia Clarkson, Shutter Island) asks Jerry to swear on his very salvation and soul that he will find the person that murdered her daughter. Almost immediately apprehend a suspect (Benicio Del Toro, Sicario), a man with severe anxiety and a mental handicap. After making a questionable confession to a rising officer (Aaron Eckhart, The Dark Knight), the suspect kills himself. Jerry, now retired, begins running over the case again and again, and starts to convince himself that maybe the confession wasn’t correct- maybe the murderer is still out there- or maybe he’s slowly going insane. A large part of me wanting to see this movie was that I’d never seen Sean Penn direct (no, I still haven’t seen Into the Wild, get off my back!). I like Penn as an actor, though the roles he usually picks makes him come off as a bit abrasive. His directorial style in this movie was really interesting, and at first it really took me a second to adjust. Nicholson, throughout the film, struggles with the question of whether or not he’s loosing his mind. His theories are somewhat farfetched as they already have an ostensible confession; all he has to go on is his own intuition. The uncertainty aspect is something that Penn executes very well in this film through various techniques. For example, when Jerry starts to spiral downwards he also starts drinking heavily. There are a few scenes where Jerry starts drinking and sort of fades into a trance, and a montage of confused images regarding the case and whatever might be happening in Jerry’s life flash before our eyes. Those scenes really convey the chaos swirling about in his mind. There are other techniques Penn uses to make Jerry feel like he’s sort of drowning where he stands; he raises the music so it almost overpowers dialogue in some scenes, some of the camerawork seems to drift and slide as if wandering through a drunken dream… But then there are also moments where everything seems normal, and that’s one of the best parts of this film: never really knowing if Nicholson is right or wrong until the very end. Most of the acting was good, not great. I feel like Nicholson gave a fine performance, but it definitely wasn’t as inspired as some of his others. Eckhart and Del Toro both oversold the interrogation scene in my opinion. Most of the other major characters did a fine job. 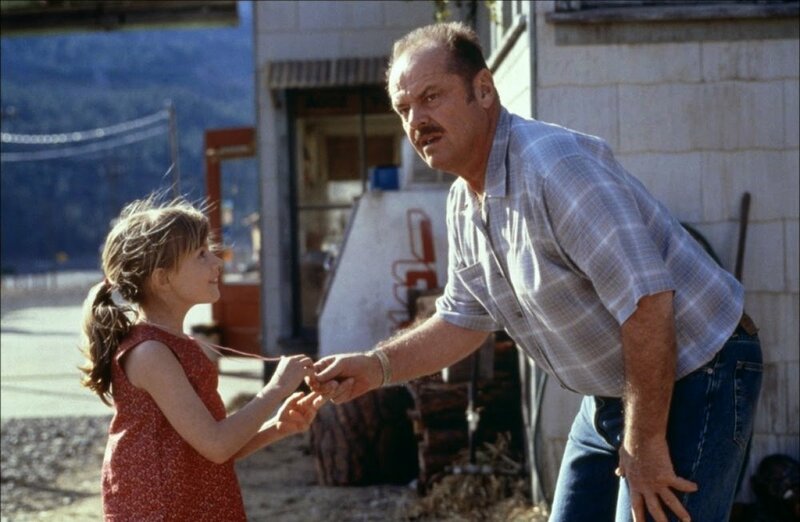 Patricia Clarkson as the little girl’s mother was absolutely heartbreaking, and the scene when she asks Nicholson to pledge his soul was incredibly powerful. Robin Wright (The Princess Bride) also has a rather important role in the second and third acts, and puts in a good performance too. There were a lot of little side characters that felt off throughout the movie. I feel like if I’m concentrating on more the cadence with which something is said instead of what is actually being said, then the delivery probably doesn’t fit the scene as well as the actor thinks it does. The ending of this movie is one that will stick with me for a while. I wont give it away here, as I do think this movie is really worth watching unspoiled. I think the ending is also one that will leave a lot of viewers unsatisfied which, I assume is why the IMDb score for this is sitting at a 6.8/10 (I personally thought it was kind of brilliant). While I thought what the ending did in terms of story was great, I don’t think the climax of the film reaches the heightened emotion that the opening scenes conveys. This is a pretty dark thriller, but if you like movies along the lines of Denis Villenueve’s Prisoners, then you could probably stomach this. There are some rough scenes as far as content, but some really powerful moments as well. Sean Penn did a really good job here. Sigh… I guess I’ll finally have to see Into the Wild now.